Who’s in, who’s out? Let’s go, boys! 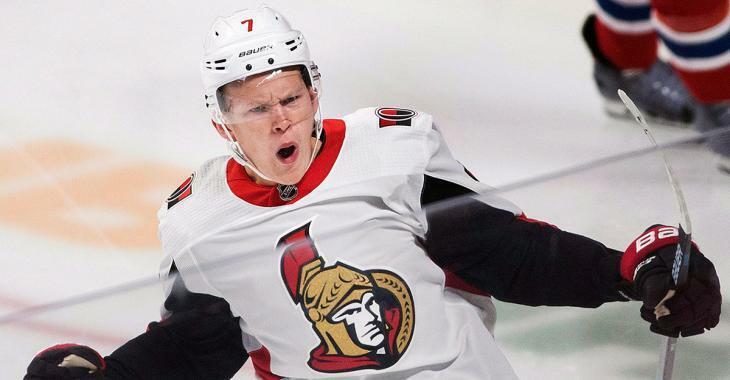 Rookie Brady Tkachuk will make his return to the Ottawa Senators lineup tonight as the team takes on the Vegas Golden Knights at Canadian Tire Centre. Brady Tkachuk returns to the Sens lineup tonight vs. Vegas. The dynamic rookie selected 4th overall at this past summer’s 2018 NHL Entry Draft has been on the shelf with a torn ligament in his leg since October 17th. With three goals and six points in his first four NHL games, it’s safe to say that he’ll be welcomed back with open arms into the Sens’ lineup. Brady Tkachuk talks about his recovery process and his excitement to be back in the line-up for tonight’s game. It also appears as thought goaltender Craig Anderson will be good to go for tonight’s contest, as well. Anderson was forced to leave Tuesday night’s game against the New Jersey Devils with a leg injury, but coach Guy Boucher confirmed that Anderson is healthy and will get the start tonight. Puck drop is 7pm ET from Canadian Tire Centre! Let’s go, boys!